The YSCT-16 High Voltage Generator is manufactured by Spellman High Voltage Electronics Corporation. Spellman is the world’s leader and producer of high voltage power supplies and X-Ray generators. YSCT-16 has a 50 kW High Voltage Generator which can produce a maximum current of 420 mA and a maximum voltage of 140 kV. This meets the scanning requirements for larger patients. 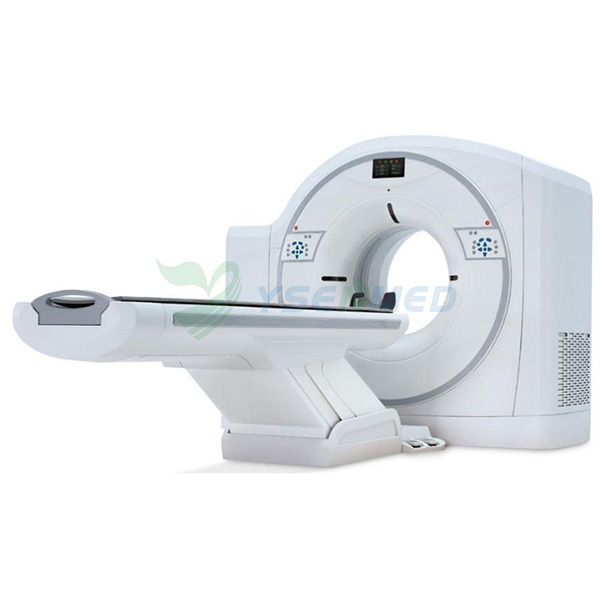 The minimum current is 10 mA which can be used for low dose scans when scanning children or regular health check-up. Tube voltage: 80 kV, 100 kV, 120 kV, 140 kV. YSCT-16 uses an X-Ray tube that is manufactured by DUNLEE, USA. The X-ray tube is a very mature design and widely used which brings stability and long tube life. The tube has an anode heat storage of 5.3 MHU and an anode a cooling rate of 815 KHU/min which allows longer scan times and high patient throughput. The tube current range is 10～420 mA. The tube voltage range is 80～140 kV. The tube focal spot sizes are 0.7*1.2 mm for the small and 1.2*1.2 mm for the large. The detector module design is non-isometric which consists of 16 slices by 24 rows. A detector row consists of 912 channels by 24 rows for a total of 21888 channels for the entire detector. The detector design fully meets all of the EMC/EMI shielding requirements. The detector is also designed to prevent any light leaks. Meeting these requirements reduces the risk of having any noise that could introduce image artifacts. The detector mechanical design is very precise and robust and will ensure reliability during high-speed rotations of the gantry. The detector design uses an optimized ultra-high speed rare earth ceramic scintillating material that increases the quantum efficiency detection. The material also has a very quick decay time and is less susceptible to radiation damage. This design ensures longer life and stability of the detector and can produce good image quality at a lower dose. The unique compact ASIC chip allows the detector module to have a smaller overall package size. The ASIC has lower electronic noise, high sampling rates and has better detection performance at low contrast levels. An innovative anti-scatter grid (ASG) with optimized tungsten plates are used in the YSCT16 system. The ASG design fully meets the Scatter to Primary Ratio(SPR). The ASG design implements a special process to maintain its stability and interface to the detector modules. The detector is segregated from the heat generating sources in the gantry to reduce any temperature variations that the detector would be exposed to. This greatly improves the thermal stability and operating environment for the detector. YSCT16 produces excellent image quality. Measuring the systems image quality using the industry standard CT CATPHAN Phantom the contrast resolution is 21.8 lp/cm at MTF 0%, 14 lp/cm at MTF 10% and a low contrast resolution of 3mm at 0.3%. Foot pedal control, table horizontal motion.